Some of the celebrities who already have stars on the Hollywood Walk Of Fame include, um, Paula Abdul, Michael Bolton, P. Diddy, Celine Dion, Kenny G, David Hasselhoff, the Olsen Twins, and the Village People. Of course, there are some worthier legends who’ve been immortalized in marble in Hollywood’s pavement, including the Beatles and the late John Lennon. But my favorite Beatle, George Harrison, has inexplicably never been among them. Until today. Full disclosure: Ringo hasn’t been starred yet, and no, Paul doesn’t have his own star , either–which understandably throws the entire credibility of the Hollywood Walk Of Fame into doubt. 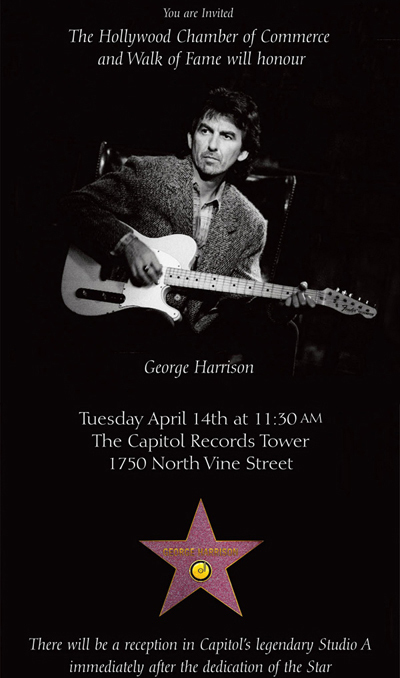 But this morning’s Walk Of Fame star unveiling for the Dark Horse–attended by his widow Olivia, his musician son Dhani, and a million A-listers, including Tom Petty, Jeff Lynne, Tom Hanks, Joe Walsh, Eric Idle, Ed Begley Jr., and yes, SIR PAUL MCARTNEY–was still cause for serious celebration. 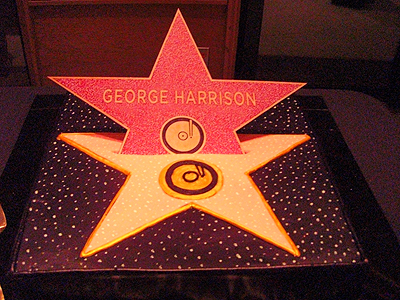 All in all, it was a very special day for music, for Hollywood, and for Capitol Records (which hosted a VIP afterparty inside its tower, where a black-frosting’d star-replica cake amusingly stained all the A-listers’ bleached veneers). Now give Paul his star already!